Our minds may grow confused and forgetful but the whole of us, our essential selves, somewhere, somehow, we will always remember. I was never sure if dad was saying something good or bad about me, but this statement does bear some resemblance to the truth. I do tend to start out each day with a sunny outlook, except in the month of October. Every year it sneaks up on me, this downward spiral, this feeling of going very fast in the down elevator. Because I am a bit thick (or a bit duck-like) I never seem to be able to remember that this time of year, early autumn, will bring about a sudden and deep depression. This has been happening to me since I was diagnosed with uterine cancer in October, 2002. Even though I was very fortunate and recovered completely from the bout with cancer, something deep inside of me still struggles with this time of year, even nine years later. I do find it interesting that my body registers the time of year before my mind seems to. Perhaps it is the cooling temperatures, the cobalt blue of the sky, and the shorter daylight of autumn that signals something deep inside of my subconscious and brings on this plunge into melancholia. Once I remember why this is happening to me, then I begin to recover and climb out of the pit that I fall into every year at this time. Recently, as I was pulling out of this annual malaise, I had an intense desire for fried chicken and biscuits with honey. We don’t usually eat meat these days, and rarely eat anything fried, but this craving would not go away. So, I bought some chicken, soaked it in buttermilk, dredged it in flour and fried it up and served it with homemade buttermilk biscuits and honey. Tom was surprised at the dinner I cooked that night, but he enjoyed it as much as I did. And then I remembered why I wanted to prepare fried chicken and biscuits. 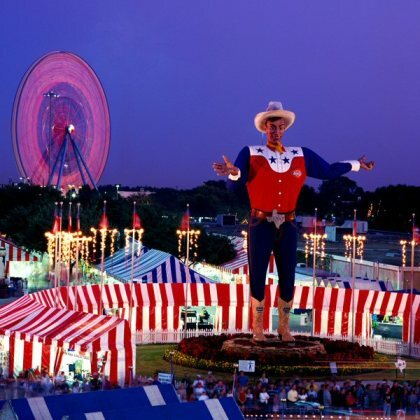 Every autumn, when I was a kid, our school closed one day so that we could all attend the Texas State Fair in Dallas. It was a wonderful day for us, my cousins, sisters and me. We would ride the caterpillar and scream when the cover closed over us as we raced around the track. Then there was the roller coaster and the double Ferris Wheel to make us scream some more. We would take a break from the Midway and poke around the barns that housed the farm exhibitions. Then, it was back to the noise and the rides and we would dare each other to sit in the very last car of the roller coaster one last time. The day always ended the same way, standing in line to buy our box of fried chicken with biscuits and honey from the wonderful restaurant, Youngbloods. They were famous for their authentic REAL southern fried chicken and biscuits. The boxes had holes in them so that the steam from the food could escape from the box (steam would make the fried chicken soggy). The steam rising from that little box was intoxicating. We sat on the grass of the fairgrounds by the duck pond, listening to the music from the band stand as the autumn sun was low in the sky, and the lights from the midway were beginning to twinkle. Later, we would meet our parents, aunts and uncles by BIG TEX, a giant cowboy statue who stood in the middle of the fair grounds. 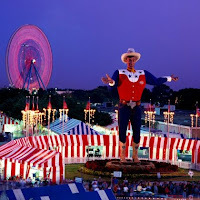 Of course, everyone else at the fair had made plans to meet by Big Tex so there was always a scramble of people trying to find their families and friends for the drive home. This autumn, I think I have finally learned the lesson that our memories are stored not only in our minds, but also in our bodies. I hope to bring this new understanding to the work that Tom and I do with people living with Alzheimer’s. Giving people the opportunity to engage their senses (even if some or all of those senses may be degraded) is such a powerful pathway to memory, reconnection and reminiscence. We remember not just with our minds, but through our bodies. We remember (body, spirit, mind) those things we tasted, smelled, felt, heard, saw, experienced. Our whole being remembers. We are not just those things that our minds may or may not remember clearly; we are walking encyclopedias of colors, emotions, we are living libraries of stories. Big Tex at the Texas State Fair. Ferris wheel in the background.